Waking up at noon. I still have this pressure in my chest that might be asthma. I used to have really bad asthma when I was younger – I was that kid in school who had to use the inhaler all the time in P.E. But I haven't experienced any asthma since then so I don't know where this came from. Catching up on writing and organizing. Grilled PB&J. Potato Chips. Fuji Apple. Yerba Mate Tea. Back home. Making dinner for Ana and I: Brown Rice Quinoa Spaghetti with Tomato Sauce, Red Peppers, Onions, a Salad, and some leftover Pizza. 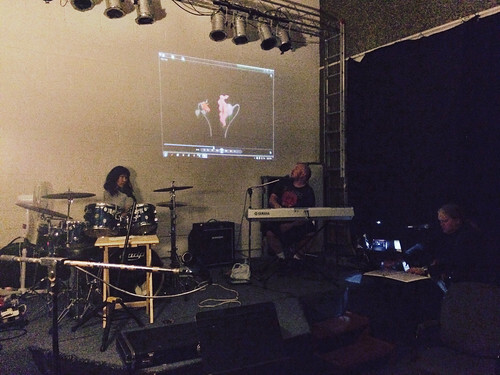 At the music space rehearsing The Wall with DEJA. I brought Ana along to join Caitlin and Kim on background vocals and other various percussion. Back home. Cutting my hair and shaving my beard while Ana bakes up a storm in the kitchen stuff to bring with us to my Dad's for Christmas. Her true colors come out later in the night after she finishes her kitchen work. She's acting a bit destructive and overwhelmed – stomping up and down the stairs – throwing her phone on the ground – not letting me help her. I try to explain that I'm here to relieve her of burdens but she refuses to let me help. I feel like she could explode at any moment. I walk into her room and demand, "Listen Ana! You need to chill for one minute. Just breathe!" She still has a mean and hostile attitude towards me and I don't like it. I try to tell her my thoughts on the matter but the closer I get the more she pushes me away. At one point she lies on the bed and as I approach her she uses her foot to keep me from getting closer. Mockingly I yell, "Yeah just keep shoving me away. Keep shoving me away. That feels really good!" as I physically roll her body over in the bed. We have the chance to calmly recap what went wrong with her today and explain our feelings. It's hard to decipher what's really happening inside that precious head of hers but I do my best.